← History, its in the making. It could be partly due to the fact that I’ve been to Burma, or that I have a deep connection to the fight against oppression that I consider Aung San Suu Kyi to be one of the most important and influential women to be recognized in the last century. But, I would say beyond my own personal bias there is a deep reverence and respect for this woman who has battled hardship and prejudice for most of her life simply because she has decided to fight for something she believes in. Aung San Suu Kyi is the daughter of Aung San who founded the modern Burmese army and is responsible for liberating Burma from the British Empire when Suu Kyi was just 2 years old. Following in her fathers footsteps she pursued politics after obtaining very reputable degrees and returned to Burma to fight for independence. Burma is buddhist country that is still enveloped in the darkness of spirituality, political oppression and military rule. Their approach to socialism has been described as ‘an amalgam of Buddhist and Marxist illogic’ by Newsweek. Overall the country has lived in severe poverty, unrest and a superstitious mentality that rules even their government. While many people will find quaint ways of saying what they believe, rarely will you find a person that puts their life behind their words. Suu Kyi has done just that, spending 15 of the last 21 years under house arrest for speaking out against the governmental powers and asking for democracy and freedom for her people. 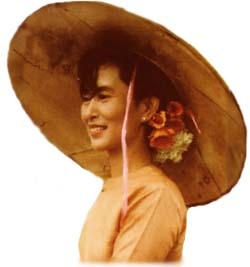 She is looked to as a national hero by the Burmese people, a model of inspiration for those who still suffer oppression, a picture of dignity who does not use her gender as an excuse for women who don’t have a voice, and an activist that has not stopped in the face of threats, hardships and dangers for those who desire to see change. A Nobel Peace Prize winner, a daughter, a wife, a mother, a politician, an activist, a woman… she has changed the world through her commitment to action against oppression. I have heard of her but did not know the depth of her story. Thank you for sharing. We should all take captive the fearful thoughts that keep us from being everything God has planned for us to be. Have a JOYful week!